Firepower, (a Thermadyne company) is an industry leader with truly innovative design and years of experience. They manufacture a full range of welding and cutting products and have a proven record of performance and dependability. Plus, there's the strength that comes from Thermadyne, the world's leading manufacturer of products for metal working and safety needs. No, These aren't your average plasma cutters. Get that thought right out of your head. If you're looking for a cheap plasma cutter, keep looking. If you're looking for a truly one-of-a-kind plasma cutter at a very reasonable price, you will find no better deal than a Firepower plasma cutter. These are the ultimate plasma cutters. OK, you're asking, what makes these Firepower plasma cutters so special? These are more than mere plasma cutters, they are packed with features and quality that you simply will not find anywhere else. 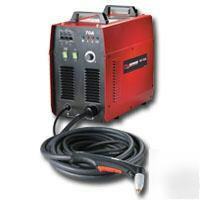 • Inverter Technology that gives superior cutting performance and increases cutting cycle. • Portable, and relatively lightweight compared to other cutters of similar amperage. • Pilot arc / drag torch system allows you to cut rusted, painted or coated surfaces without prior surface preparation. • Can cut grates, chain link fence and perforated steel without restarting the torch. • Built solid, with rugged roll bar design to protect unit. • Auto pilot restart, which will speed up your cutting time significantly. • The new 1Torch unique design has many features such as a reduced heat affected zone for quicker fit up and better quality cuts with much less distortion. A favorite for use in heavy maintenance, fabrication and scrap metal, this machine delivers clean cuts on most 3/4" metals including stainless steel, aluminum, mild steel, copper or brass, with minimum heat input and distortion of metal. It also cuts through rusted, painted or coated surfaces without prior surface prep. The inverter based technology operates on standard 230 Volt, single or 3-phase power. Simply connect to an air compressor or other air source, and this system is ready to cut. Starts without high frequency - no interference with computers and controls. PLEASE NOTE: The manufacturer's warranty does not cover any product or part which has been subjected to misuse, abuse, modification, negligence or accident, nor does it cover any product which is used for any purposes other than that for which it is intended as stated in the specific manufacturer's product information literature. HOWEVER: I must be notified, via email, within 3 days of when you received the item that it is damaged or defective. If you wait more than 3 days all warranties and guarantees are voided.